As part of a project with Harvest Public Media, the Midwest Center for Investigative Reporting analyzed electronic federal lobbying reports to get a closer look at which special interests lobbied on the recent Farm bill, otherwise known as the Agricultural Act of 2014. Understanding lobbying expenditures is a complex and time-consuming project. The Midwest Center for Investigative Reporting sought to examine the lobbying on the Farm Bill and its related issues from the beginning of 2012 to the first quarter of 2014. First, Midwest Center researchers downloaded raw data – the lobbying disclosure reports filed by outside groups, companies and lobbying firms – from 2008 through early 2014. Researchers also searched for bill numbers of the pieces of legislation that ultimately became the Farm Bill or a precursor to the bill. That list included: HR 1739, HR 1995, HR 1980, HR 6083, HR 1947, HR 2642, S 685, S 3240 and S 954. Next, the team used Access to delete duplicate filings, as both clients and lobbyists have to disclose their lobbying efforts. Researchers also filtered the list for filings related to 2012, 2013 and 2014. After that, they then screened the list of disclosure filings and removed remaining obvious duplicates by hand. Finally, they deleted filings where search terms were not related to the Farm Bill. Searching for “SNAP” may yield a reference to “snapper,” for instance. Because lobbying clients need not detail their specific lobbying activity, it is likely that the final list of filings does not include every instance of lobbying related to the Farm Bill during the given period. 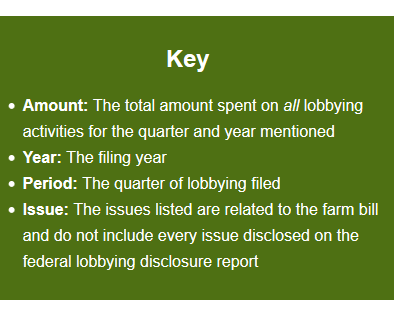 Access the results here: Farm Bill Lobbying Interests.